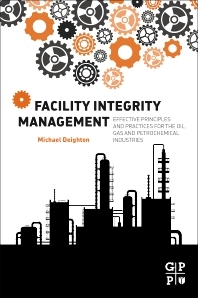 Facility Integrity Management: Effective Principles and Practices for the Oil, Gas and Petrochemical Industries presents the information needed to completely understand common failures in the facility integrity management process. By understanding this more comprehensive approach, companies will be able to better identify shortcomings within their respective system that they did not realize existed. To introduce this method, the book provides managers and engineers with a model that ensures major process incidents are avoided, aging facilities are kept in a safe and reliable state and are operating at maximum levels, and any gaps within the integrity management system are identified and addressed, such as the all too common fragmented reliability programs. The book approaches oil and gas facility management from a universal perspective, effectively charting out existing oil and gas facilities and their associated work processes, including maintenance, operations, and reliability, and then reconstructs them in order to optimize the way integrity is managed, creating a synergy across the various elements. Easy to read, packed with practical applications applied to real process plant scenarios such as key concepts, process flow charts, handy checklists, real-world case studies and a dictionary, provides a high quality guide for a breakdown free facility, maximizing productivity and return to shareholders. Michael Deighton, MENG, CENG, MBA, FIMECHE has 20 years of experience in the oil, gas, and petrochemicals sectors. He has worked for some of the world’s leading blue-chip oil, gas, and petrochemical companies within the fields of facility integrity management, maintenance, operations and projects and has held titles such as Refinery Maintenance Manager, Reliability Champion, Operations Manager and Projects Director. He has worked for international oil and gas operators and tier-one engineering, procurement, and construction contractors. Michael earned an MBA from the University of Teesside Business School and a Master’s degree in Mechanical Engineering from the University of Newcastle and is a Fellow of the Institute of Mechanical Engineers.